50meters of frontage on main street - great retail spot! 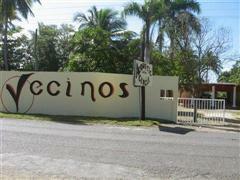 Vecinos is an acre-plus (4252 sq meters) development resort, which offers an exceptional ROI. This beautifully developing jewel within the Dominican Republic provides an incomparable island getaway, sports destination or exciting vacation or destination wedding rental spot, along with excellent return on investment. Its’ location is ideal - on the edge of Cabarete – a world renowned windsurfing/kite-boarding destination and one of the top 5 developing areas in the Dominican Republic – and across the street from the ocean, where you can enjoy gorgeous mountain and ocean views. Minutes from the hopping night life in Cabarete, you can relax in serene tropical ambiance while enjoying a beverage poolside at the thatched roof bar, providing the best of both worlds. The acreage has beautiful landscaping with many mature trees. 4 completed condos, a gorgeous large pool with thatched roof bar poolside, and elegant open-air reception hall already generates revenue with vacation + destination wedding rentals. With lots of room for expansion, development plans are flexible. 11' high ceilings + stately white columns grace the open-air reception hall in the center of the retail space. It would make an awesome art gallery, furniture showroom, restaurant, health spa + fitness center, instruction classroom, convention center, or myriad of retail options. Currently, it hosts a bustling weekly Saturday Market, that's become as much a social event as business enterprise. Expats and locals mingle to browse for treasures from the local vendors, and catch up on the latest news over an iced-coffee + German pastry (or beer + popcorn). The condos would also be perfect for a bed & breakfast business or a small company’s ownership as an employee retreat/convention center. If purchased as a family vacation destination, it could accommodate a whole extended family and friends in comfort and tropical beauty. It brings you that wonderful tropical climate and a personal touch - the feeling of neighborhood with the comfort of home. The first condo building was completed in 2007 and has two 1 bed/1bath on the main level, and two 2bed/2bath condos on the second storey, with tastefully designed + furnished interiors. 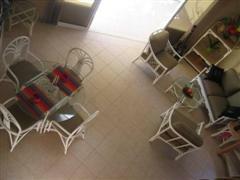 Our brand new condos are fully furnished. They have GE fridges, propane stove and hot water on demand system supplying unlimited hot water, central air-conditioners. We're on the 24-hour power grid, and have a back-up inverter and generator to ensure constant power. There are ceiling fans, beautiful hand-crafted wood cupboards and medicine cabinets, granite-composite counter tops with double sinks in the kitchen and spacious balconies to fully enjoy tropical outdoor living. 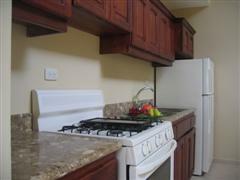 All the condos have cable TV, high speed internet wi-fi, and phone land-lines ready for installation. Surf the internet on your laptop poolside or anywhere on site. Pick mangos, avocados, or chinola from the upper condo balcony or guavas, chinola, oranges, breadfruit, almonds, coconuts, rollos and bananas from the garden when they’re in season. Our original plan was for an additional 5 buildings, each of which would also have two 1bed/1bath units on the lower level and two 2-bed/2bath condos on the second level, for a total of 24 condos with 36 bedrooms. The option to add storeys to each bldg would generate even more revenue, for a higher ROI. Or a new owner could capitalize on what's already completed, and generating rental revenues. The gorgeous kidney shaped pool is approx 8m x 18m. and uniformly 1.5m deep, surrounded by a laja (similar to flagstone) deck and 4 authentic palapas (thatched roof umbrellas). Next to the pool is the bar with a thatched roof, boasting an impressive curved 5 meter mahogany bar-top on the main bar and a 2.5m suspended mahogany stand-up bar, both of which were hand-crafted on site by a master craftsman. The original 240 sq meter house has been renovated into a 450 sq meter space, ideal open-air retail space for a restaurant or convention/meeting area. Two bathrooms are located off the halls beside the main center area, and 4 other rooms which are currently used as a kitchen, storage, and 2-bedroom/1-bathroom apmt are also adjacent to it. The flat roof has electric and plumbing lines built in, ready to build a 450 sq. meter 3-bed/2bath residence on, with a wide open concept and wrap around balcony, designed to take full advantage of its’ lush tropical surroundings. It's currently developed into a rooftop terrace with several palapas for shade, overlooking the ocean view to the front, and beautiful mountains to the back. 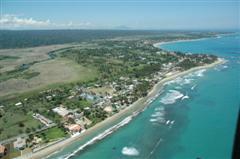 Cabarete is rapidly expanding and currently enjoying a real estate boom where the property values in our area have more than doubled in the past two years, tripled in the last three, and Quadrupled over the last four, so the BEST time to buy is NOW! 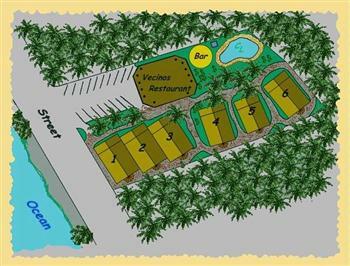 Vecinos is a gem of an affordable find in this exploding market, as there are a dozen large, high to medium-end condo projects under development in our area. The current land value is $400,000+ USD and the completed condo building now retails at $459,600. The renovated restaurant building, new thatched roof bar and pool, and infrastructure add well over $400,000 in value, plus there is the option to complete the project according to our plan for an additional $1.3 million projected return. This makes the price of $1,249,900 an exceptional value and an extremely attractive investment with the superior ROI of over 40%! PRICE SLASHED TO SELL!!! * $750,000 USD * WOW!!! 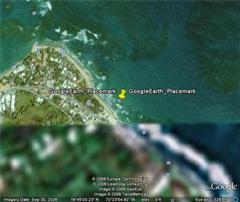 It’s truly a “must-see-to-believe” magical spot and we invite anyone interested to come and see for themselves! We’ve now lived here since 2004, and find it’s time for us to move to a location which better allows us to reconnect with those powerful “magnets” of family and grandkids, so have priced it to sell quickly. We are offering financing to a qualified investor.